If you think you have seen these same freediving fins also offered by another extremely well respected company, you have. MAKO Spearguns and another well respected company both have licensing agreements with the original maker of these high quality fins. But, because I sell direct to you, instead of through dive shops, my freediving fin prices are much lower. Exact same factory. Exact same quality. No dive shop markup! For more information on “MAKO DIRECT” pricing, click here. At MAKO Spearguns we pride ourselves on producing some of the highest quality freedive fins available. For example, our Competition Freediver fins are a professional grade freediving fin featuring foot pockets with removable blades for easy change outs to fiberglass or carbon blades. 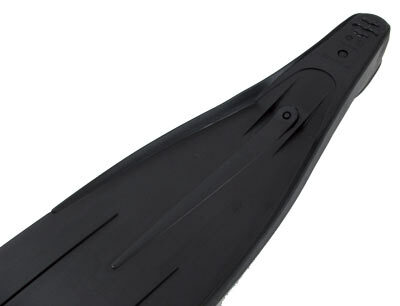 Having said that, we recognize that not all divers need or want a professional style fin, featuring removable blades…. So, we also offer the “Freedive Hunter Freediving Fins”. Although these fins have fixed blades (permanently attached to the foot pockets), they are very good quality freediving fins. The foot pockets are made of the same thermoplastic rubber used in high end foot pockets. These foot pockets are soft for comfort where needed, but stiffer where needed for increased transfer of energy. The blade is made of a highly flexible yet strong Polypropylene composite material, designed to maximize thrust and stability. This is no cheap, off the shelf, fin found at sporting goods stores. These are probably the finest entry level fins available. Note: If you have any questions regarding size, please feel free to call us. We are happy to help. Work really well. I'm a women's 7.5 or 8, and the size small fits wonderfully with 3mil socks. The foot pocket on these is insanely comfortable. The fins themselves are a little stiffer than expected. I find them pretty similar to my old Cressi Gara 3000 LDs, but at a better price. I'd prefer a softer flexing fin, but that might just be personal preference. I'll save up and get a pair of the MAKO fiberglass fins next time.